The polling for the Lok Sabha Elections 2019 has begun, with the first phase being held 91 Lok Sabha seats in as many as 20 states and union territories. Besides, people in Odisha will also vote for their respective parliamentary and assembly elections. Many voting awareness campaigns both online and offline were conducted to increase the number of voters during the General Elections. Being a responsible citizen and most followed personality in India, Padma Shri awardee, Sudarshan Pattnaik urged registered voters to come out and vote through beautiful sand art. 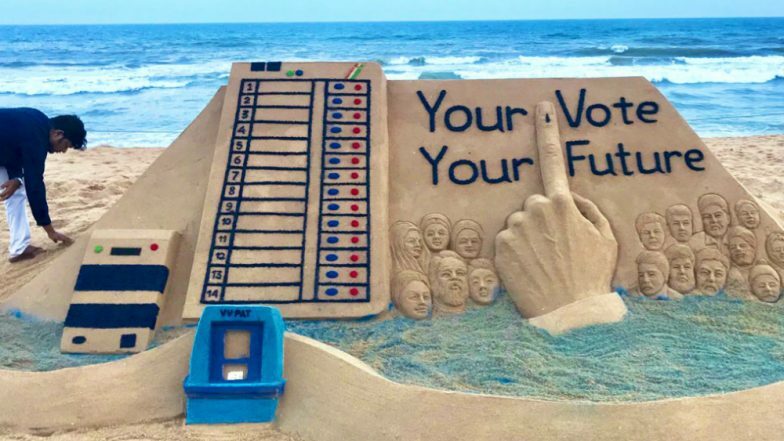 In the most accurate manner, Pattnaik depicted, "Your Vote, Your Future," with fantastic sculpture in his art, which is created at Puri beach in Odisha. Quotes & Messages Urging Citizens to Participate in Lok Sabha Elections 2019. The four constituencies in Odisha voting today are Kalahandi, Nabarangpur, Berhampur and Koraput. Pattnaik who hails from Odisha, never misses any to participate and increase awareness in all the important events with his impactful sand art. With an EVM machine and ink on the index finger as a mark of voting, Pattnaik appeals, "I request all the voters to please #vote for nation's development. My SandArt on #VoteAwareness at Puri beach in Odisha. #Elections2019." Lok Sabha Elections 2019 Complete Schedule. The electorate fate of many political bigwigs is at stake today. The voting is underway for polls to the 20 states and union territories. It is only the first phase of a national election, and so far, the voting turnout has been reported fair. According to the Election Commission of India (ECI), voting for 543 Lok Sabha seats will be held in seven phases: April 11, 18, 23, 29 and May 6, 12, 19 and the counting will take place on May 23.